I first encountered the Polish composer Krzysztof Penderecki through his 1961 piece Threnody for the Victims of Hiroshima. Some years later I discovered Die Teufel von Loudon in a splendid Philips recording which, as far as I’m aware, has never made it to CD. However, there is an Arthaus DVD of the Hamburg studio production under Marek Janowski, which may be worth investigating (Arthaus Musik DVD 101279). The works on this disc range from the more avant-garde, experimental Polymorphia of 1961 through to the neo-Romantic Hymne an den Heiligen Daniel (1997) and two choral pieces inspired by Karol Wojtyla, otherwise known as Pope John Paul II. At the helm is Antoni Wit who, along with his Warsaw band, is a mainstay of the Naxos catalogue. In particular I enjoyed this team’s Má Vlast (Smetana) and, especially, their Mahler 8, both very fine performances indeed. The work opens with menacing drum rolls and sombre strings. The liner notes describe the work as an example of the composer’s ‘monumental neo-Romanticism’, which is as good a description as any (though monumental might be closer to the mark). The choral writing may have an austere spikiness, but the solo lines sound rather more conventional. Again the mood is anything but uplifting; indeed, if I were to be uncharitable I’d suggest it’s a tad lugubrious at times. The soloists sing with plenty of east European vibrato, although I suppose one could argue it is a more authentically Polish vocal style appropriate to a work such as this. The choir – placed quite far back – sing incisively enough but the big climax at 8:40 sounds rather messy and unfocused. There is some respite at the close, with the gentle shimmer of untuned percussion underpinning the muted voices, before the motoric martial opening to Part 2 (‘The army of martyrs praise Thee’). This is certainly Penderecki in monumental mode, with great blocks of choral and instrumental sound punctuated by the soloists’ supplications. The choir respond with gusto in this movement, Penderecki opting for pizzicato strings to carry the solo vocal lines. The frigid finale is about as near to repose as we are likely to get in this music. The third movement opens with a muted choral invocation to the ‘God of Poland …wrapped in great light, power and glory’, interspersed with some limpid singing from the soprano. The first climax is brutal in its dissonance, the battery of timps powerfully reasserting the martial rhythms of Part 2. As much as I wanted to be drawn into this music I felt a curious detachment throughout. Occasionally there are instrumental touches (such as the soft pulse of gongs at 5:20 onwards) that draw the ear but rarely engage the heart. The Hymne an den Heiligen Daniel comes as a ray of sunshine after the unremitting gloom of the Te Deum. Sung in Church Slavonic – as in the Grechaninov Passion Week I reviewed recently – this hymn seems to have more in common with Eastern Orthodoxy. The first section (‘Slava’) certainly has a strong liturgical flavour, with its gently undulating choral writing. The gong strokes add to the atmosphere of mystery, with ecstatic brass and choral interjections. There is also a strong, flexible rhythm here, the old Slavonic cadences adding a genuine sense of fervour to the music. This is much more vigorous, more harmonically interesting and varied than the Te Deum (there is some febrile writing for the trumpets, too). And what a heaven-storming finale. Definitely the composer at his most approachable. 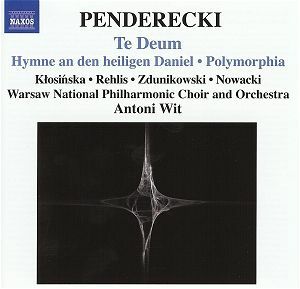 The experimental Penderecki is represented here by Polymorphia. As with Threnody (written in the same year) this piece is for strings only, beginning with a long, hypnotic figure for cellos and basses. There is a process of harmonic metamorphosis as Penderecki adds more ‘layers’ to this foundation. The results are pulsating glissandi that grow in weight, volume and complexity. The similarities to Threnody are very striking indeed, Wit bringing out all the jagged instrumental and rhythmic elements of the music. Ideally a more transparent acoustic would have helped here – and in the other works, come to that – but one can’t deny the extraordinary frisson of those percussive tuttis, which have all the savage abandon of a pagan rite. Penderecki also manages to achieve long orchestral lines that even sound like unison voices; technically very adroit, but very much a piece of its time. Needless to say the orchestra respond with enormous energy and precision and the engineers must have had a field day trying to capture the work’s sheer weight and complexity. The Chaconne is not taken from the Polish Requiem (as one might assume from the track listing) but is a lament for Pope John Paul II, who died in 2005. Subtitled ‘in memoria Giovanni Paolo II’, this is bold and stark in its appeal. It also has a fleeting intimacy in places (a glimpse, perhaps, of the gentler man within) but the biting upper strings and grinding basses eloquently remind us of public grief as well. When the first Naxos CD appeared twenty years ago few thought the company would become such a fertile source of interesting repertoire. Granted, some releases are going to be more successful than others, but in this case Naxos have put together a well-chosen programme that offers a good introduction to Penderecki’s work, past and present. The playing is committed and the sound is adequate, but I would particularly like to hear Hymne an den Heiligen Daniel recorded in a more grateful acoustic. This disc may not appeal to everyone but I’d buy it for this work alone. Universal have informed us they have no plans to re-release this set at the moment.